Americans celebrate Memorial Day on the final Monday in May; it is a day set aside for remembering the men and women who died while serving in the Armed Forces. Originally called Decoration Day, the observance began in the late 1800s and was designated to commemorate the Union and Confederate soldiers who died in the War Between the States. After the First World War, the name was changed to Memorial Day and the observance extended to honor every American soldier who died while serving our nation in all military engagements. Who better to speak of sacrifice than our Sacrificial Lamb? Jesus calls it a “greater love” when we are willing to lay down our lives for others. 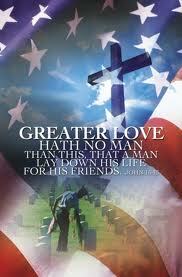 Every fallen American soldier has demonstrated this greater love for all of us. Let us give God praise and thanks for their willingness to lavish this greater love on us. And yet, in Christ we see an even higher, more exalted love. We see the Good Shepherd’s humble willingness to lay His life down for His sheep. “He humbled himself,” Scripture tells us, “and became obedient to death — even death on a cross!” (Philippians 2:8). The very essence of self-sacrifice and sacrificial love is found in Christ alone. And there is something truly amazing to notice about the sacrifice of our Savior. Unlike those who sacrificed their lives for their “friends” (fellow man), Christ sacrificed Himself for His enemies! It’s one thing to lay down your life for a friend, but it’s another thing altogether to do if for your enemy . . . and that is exactly what we were when Jesus took our place and died on our cross. We were rebels running from our Savior, not toward Him. We were clinging to the throne of our lives, with no thought whatsoever of relinquishing the throne to Jesus. Yet in spite of our unwavering enmity toward our Savior, He laid down His life for us. WOW! Truly this is a love that we simply cannot fully comprehend. A love so amazing that it would die for its enemies. So on this Memorial Day, let us remember all those brave men and women of our armed forces who gave their all for our freedom. Let us honor their memory by doing all we can to support all those who are currently serving in our armed forces around the globe, as well as all of our returning veterans and their families. And as we remember our veterans, let us also remember our Lord Jesus Christ and the unimaginable sacrifice He offered on our behalf. Remember that He took our beating, our mocking, our nails, our crown of thorns, our forsaking by the Father, and ultimately our death . . . all so that we who believe in Him by faith might have eternal life.